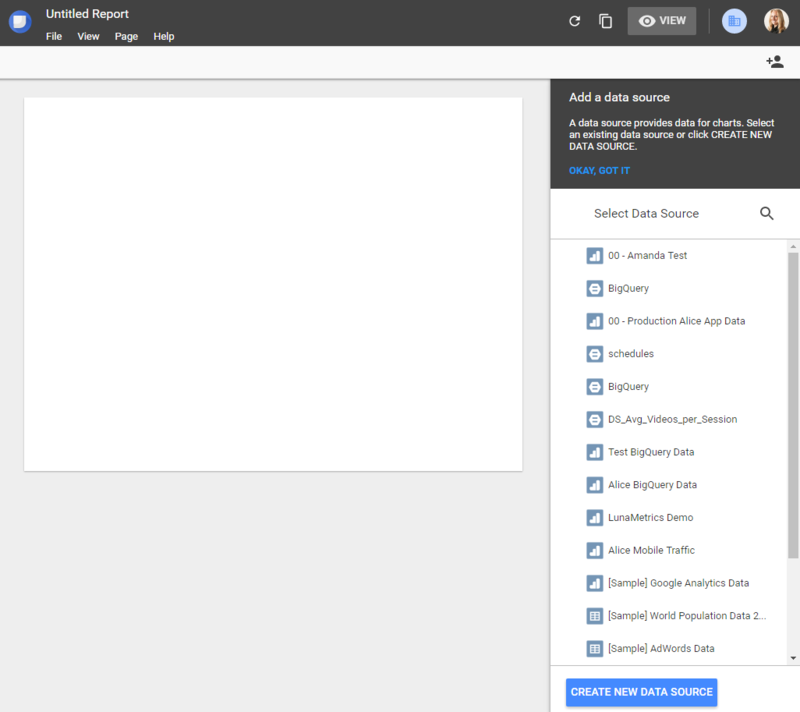 Among its many benefits, Google Data Studio easily connects with Google BigQuery, giving you the ability build custom, shareable reports with your BigQuery data. Google Analytics 360 users that have set up the automatic BigQuery export will rejoice, but this benefit is not just limited to GA360 customers. Anyone with any data set in BigQuery can take advantage of this capability! Since its release Data Studio has quickly become a preferred method of building clean, collaborative reports and dashboards. It offers far greater flexibility than anything you could build within the Google Analytics interface, and its direct connector to BigQuery makes it even more powerful. This post assumes that you already have a BigQuery account. If you do not, but still want to follow along, there are a couple demo data sets you can access (I’ll point those out later). 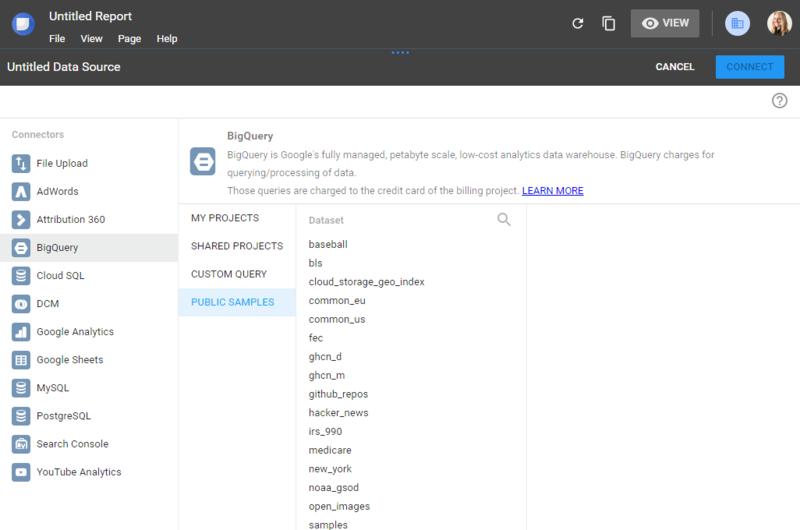 Why Bring BigQuery Data into Data Studio? … and of course, get unsampled reports! Not only does Analytics 360 have the ability to bring Google Analytics data into BigQuery, but other Google tools also have data integrations, such as Firebase Analytics as well as ad tools such as AdWords and DoubleClick platform products through the newly announced BigQuery Data Transfer Service. 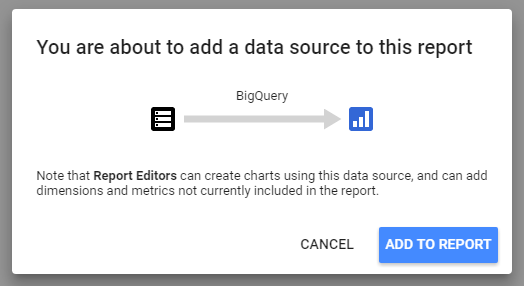 In this post, we’ll discuss the basic steps to connect your Data Studio report to your BigQuery data, and we’ll provide a few tips along the way. The first thing you’ll want to do is go to datastudio.google.com and open up a new report (or an existing one that you want to work with). In this example, we’ll start with a new report. Next, you’ll want to add a new data source. There are a variety of available Connectors for Data Studio; we’re going to select BigQuery. Note that if you are working with one of the sample data sets, you should take a look at how the data in that data set is structured in order to know how to query from it. Queries for Google Analytics data will likely be different than what you might use for one of these demo data sets. Visit bigquery.cloud.google.com to see the data sets available to your email account. Also – now is a good time to go up the top left corner and rename your Data Source! One important distinction to note is the difference between connecting to a BigQuery project (such as a personal project, shared project or public sample project) compared to writing a custom query. Choosing a project allows you to select a pre-existing table that has already been created from within BigQuery. Custom Query (you guessed it) allows you to write your own query, and you can do so right from within the Data Studio interface. Either option will allow you to access data in BigQuery and use it to build and customize your reports (such as dynamically selecting date ranges, which we’ll get to in a second). The key difference is the fact that you are actually building your queries from different locations: within BigQuery to build a project table or from within Data Studio entirely with a custom query. 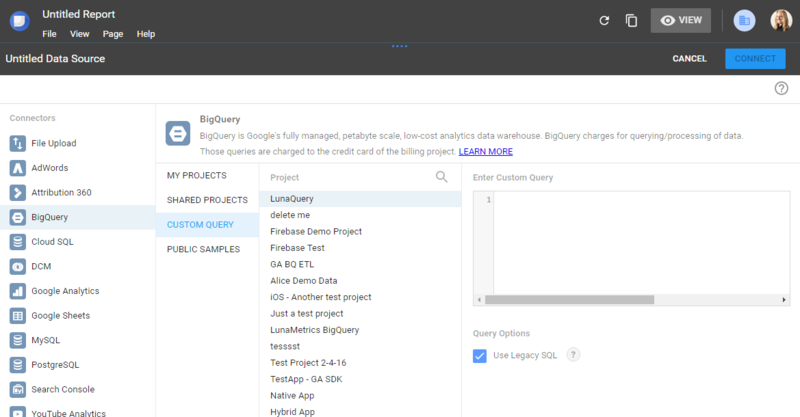 Depending on how comfortable you are with writing your own queries and the preferences your organization may have around data management, you may wish to have someone else on your team build the custom tables for you from within the BigQuery interface so that you can simply select from pre-existing tables when creating your Data Studio report. If you have a pre-existing table to choose from, simply select it and then hit the blue CONNECT button at the top of the screen. What’s Missing in the Google Analytics BigQuery Export Schema? Regardless of whether you choose a predefined table or a custom query, you will likely want to make sure you are selecting a dynamic date range so that your report can continuously be updated automatically each time you view it. The TIMESTAMP(CURRENT_DATE()) piece will allow you to capture the most recently available data each time the report is run. Once you have run your query successfully (an error message will appear if the query fails) you will see a list of the dimensions and metrics that you can now add to your report. Add your data source and then you’ll be ready to start building your report with your new metrics and dimensions! When you want to rely heavily on BigQuery for building your reports, it helps to think ahead and plan out all of the pieces of data that you want so you can use as few queries/connectors as possible. For example, instead of creating a query for all users who visited your site on a desktop computer, make your query more general and use the built-in filter functionality inside Data Studio. This is a very basic example, but using this approach allows us to have various sets of graphs for different device types without needing multiple queries. How Will Data Studio Impact My BigQuery Bill? Generally, you are going to be charged for each query to a BigQuery database. However, it is helpful to know that Data Studio will cache the data in your reports so that you are not charged for another query every single time the report is opened within the same day. Tell us how you’re using Data Studio to visualize BigQuery data!